A clever way to blend a modern dwelling into a natural wonderland. The ultimate example of a house that blends into its natural surroundings, the striking Los Terrenos combines contemporary design with minimalism in a refined way. 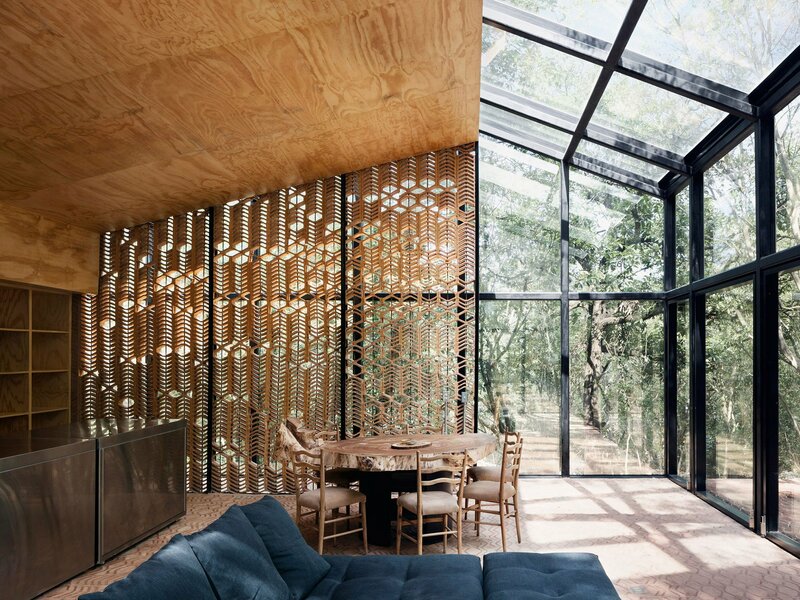 Designed by Mexico City-based Tatiana Bilbao, this vacation house integrates into the woodland of a mountainous area near the city of Monterrey. The three-volume structure features a gable roof that referenced the surrounding mountain tops. The large socializing area with a living room, dining room, and kitchen boasts a striking mirror facade. Thus, the structure reflects the beauty of the forest, while also becoming a part of the environment. Inside, the inhabitants can freely admire the woodland through the mirrored glass. Concealed doors also open up the interior to the outdoor space when needed. Another volume with an L-shape contains two bedrooms and a bathroom. Here, the studio used mainly textured clay bricks and rammed earth, in a gorgeous contrast to the sleek, mirror facade. The third section, still in development, will feature mostly wood surfaces, completing the refined triad of materials in style. Photographs© Rory Gardiner.